Not only did my Stampin' Friends get the joy of inking up this beautiful stamp, but they got a FREEBIE technique on this card with Top Note Square that they made using the Top Note Die. I got the idea for this card from a swap I received from Gretchen Barron which you can see HERE (Her card is the very last one on the post, so just keep scrolling down). Gretchen has a great tutorial on her blog which you can find HERE. Hmmm? And what do you know...my card looks surprisingly like Gretchen's card...Hmmm? Why mess with perfection...right? I did rotate it AND I used different ribbon AND I added 2 little rhinestone brads...see, I didn't totally CASE it!! Rolling Marbles...what a fun technique! This is something you could even do with your little kiddos & they will think you are THE BEST & MOST FUNNEST PERSON EVER! For my June Simply Scrappin' Club we used the Tailor Made Simply Scrappin' Kit. We've done quite a few "flowery & girlie" pages, so we wanted to be sure we had some masculine pages for the boys & men in our lives! Once again I have put suggested photo size & placement guides directly onto the pages. I was inspired to make the above pages from a layout that I saw on fellow Control Freak Kim Van Diepen's blog which you can find HERE. 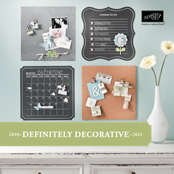 There is room for up to 6-4x6 photos & plenty of room to journal on the Sizzix Top Note Die Cut Outs (which is only available through Stampin' Up! )....the photos will overlap the Top Note Die Cut Outs just a little bit. As a side note, I just read her most current post & found out that at the Stampin' Up! Convention she was announced as the #2 Demonstrator for the Year AND she was selected to be one of the members of the Advisory Board! Way to go, Kimberly!! I love being able to put LOTS of photos on a page, so I hope you are enjoying the wide open spaces on these pages. I cannot for the life of me find the original pages that inspired me to make these pages, but I did find another set of pages that had the exact same layout & you can find it HERE. I don't know if these pages might have been from a sketch challenge, which would explain the similarities from the original one I CASED & the one I linked to above. Anywhoo...on to the next set of pages! These pages were taken straight from the Tailor Made Simply Scrappin' Kit product insert page. Stampin' Up! pays people to create cool layouts, so why not just go with it?? No need to reinvent the wheel...er, scrapbook page, right? These last pages were inspired by Andrea Walford's Walk in the Park Pages HERE. Be sure to check out THIS POST which showcases her FANTABULOUS Stampin' Studio!! WOW!! Here's the last set of swaps from the latest Control Freak Swap! Boo-Hoo! Here are some more Control Freak Swaps to spark your creativity!! Made by Katy Clark...too cute! Made by Lisa Martz...swap mom extraordinaire! Made by Mary Beth Brown...Love it! Made by Melanie Schulenberg...I really like the touch of blue to the wing! Continuing with the Control Freak Swaps!! Still made by me! But I wanted to be sure you got a close up look at my little acorn that I loving hand colored & cut out & popped out with a Stampin' Dimensional! Control Freaks are at it again!! You are going to love all the beautiful cards I'm going to post this week. These cards are from the Control Freaks New Hostess & Pre-Order Sets Swap from the Brand New Stampin' Up! 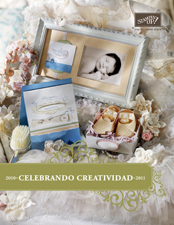 Idea Book & Catalog. Hold onto your seat belts!! Made by Annette Jensen...see how this cool card opens up! Wowzer! Made by Connie Babbert...not sure what go on the card in the upper left corner...definitely not part of the original...sorry Connie! Here are the pages that we made at my Simply Scrappin' Club last week. We used the Happy B-Day Simply Scrappin' Kit...which is brand-spankin' new in Stampin' Up! 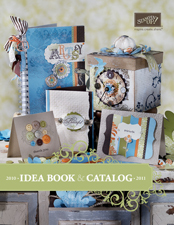 's 2009-2010 Idea Book & Catalog! I've tried something new: Since I don't have photos on these pages yet, I have added some photo size & placement guides on them. Let me know if this helps you out or distracts you. Don't forget that you can click on the photos to see them larger. I was inpsired by Mandy Grant's Layout on her site www.l-inkedtogether.com I used the new Sizzix Scallop Square Die to cut out the Large Brocade Blue Scalloped Squares...quick & easy!! I wasn't sure that I wanted all these pages to be actual birthday pages, so I left the "b" off of the "b-day", but there is plenty of room for me to add it if I need to. My hubby tightened up the security on our home computer, so now some of my sites are blocked...this being one of them, so I am posting her original layout here & I've given you the link above to her site. The following three layouts were all from sketches I received as part of an online class Got Sketch 102. You can find out more about the Got Sketch online classes HERE You can even purchase some of their classes as an instant download!! I used the BRAND NEW Stampin' Up! Exclusive Sizzix Simple Letters Bigz Dies to punch out the "happy b-day" letters from the DSP in the kit. The Large Ruby Red Star above & the Large White Star below are from the Sizzix Stars #2 Original Die. The Crushed Curry Stars are from Stampin' Up! 's Star Punch. I used the Taffy Alphabet on the "celebrate today!" title above, and I used the Varsity Alphabet on the "FRIENDS" title below....of course after I put it all together, I realized the title might also appear to say "FINS RED" (tee-hee), but trust me, it definitely says "FRIENDS". So as not to waste all that beautiful DSP under the Certainly Celery Textured Card Stock, I trimmed out a large square on both sheets. From the back it looks more like a frame. Now I can use that DSP on another project. I hope you have enjoyed my last several postings with the Happy B-day Simply Scrappin' Kit! By the way, I just wanted to let you know that I only used ONE kit to make these 4 sets of pages & the 2 clipboards!! There was plenty of DSP to go around & then some! (Okay, I did use some extra white for the titles & some extra brocade blue for the scallop squares, but it was the DSP that I was using on the clipboards. I would have had to use the extra white & brocade even if I hadn't made the clipboards.) And I have LOTS of Adhesive Die Cuts left over to add to my pages when I put on the pictures & to use on other projects. These Simply Scrappin Kits are such a great value!! PS...Please let me know what you think about my adding the photo size stuff onto the pages. Is it helpful or distracting? ?